Annin NYL-GLO ColorFast U.S. 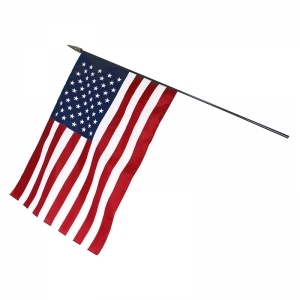 Flag measuring 4 ft x 6 ft is made from SolarMax nylon material that resists ultraviolet radiation. It is guaranteed to retain color fast for at least one year. Ii has bright colors that provides a good appearance and flies in the light breeze. 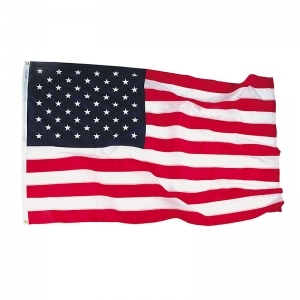 Flag with strong canvas headings and large grommets is durable, fast drying and has brilliant colors. Flag with large, full size dense-filled embroidered stars features hand fitted, double needle seam with back-stitch reinforcement. It has two rows of stitching on top as well as bottom hems and four rows of lock stitching with back-stitch reinforcements. Flag features premium quality extra-strength polyester thread, color matched to stripes, front and back. 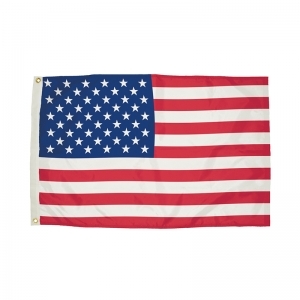 Colonial Nyl-Glo Flags feature high gloss, densely embroidered stars and lock-stitched, hand sewn stripes and hems. Finished with flannel-lined pole heading, Velcro tabs and golden yellow rayon fringe. For indoor use. Verona Brand Hand-Help U.S. 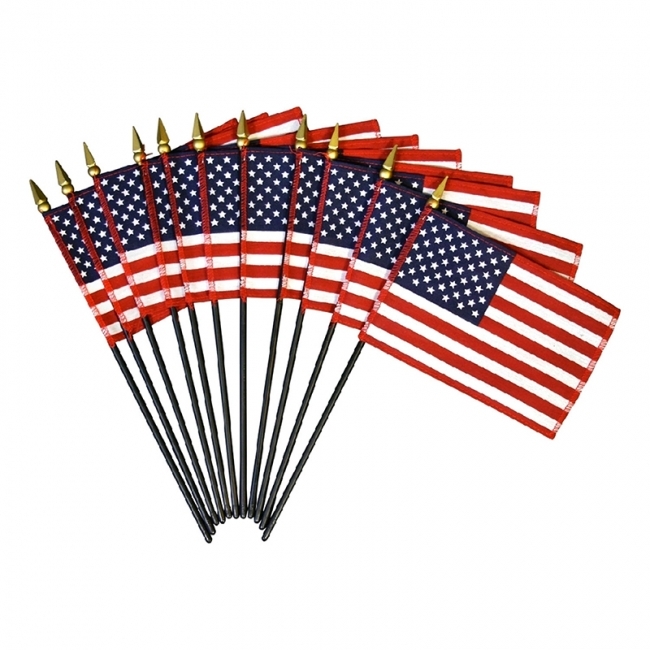 Flag measures 4" x 6" with a 3/16" x 10" black staff and a gold spear tip. This flag material is a fabric blend with the look and feel of cotton. 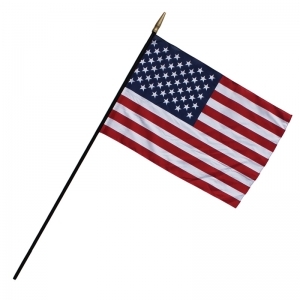 Engineered to be fade resistant in outdoor conditions, Verona Brand Flags wave proudly at parades and are most often used to mark our veterans' graves. Verona Brand Hand-Help U.S. 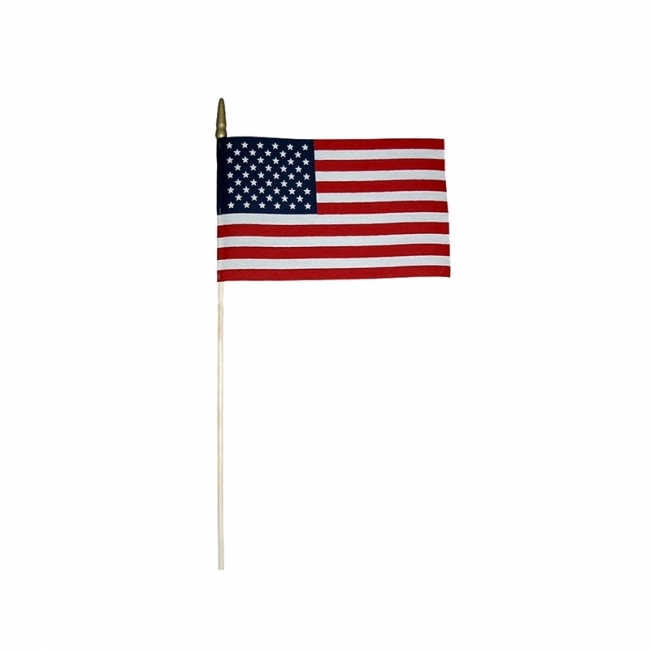 Flag measures 8" x 12" with a 5/16" x 24" black staff and a gold spear tip. 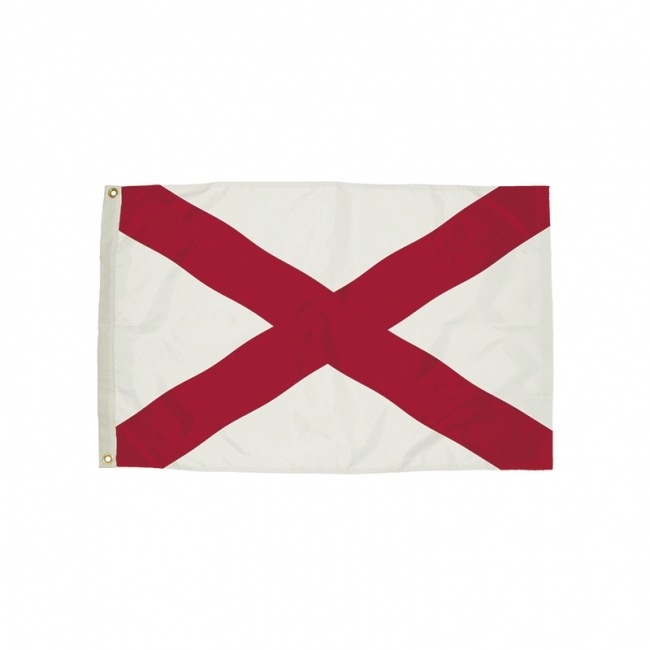 This flag material is a fabric blend with the look and feel of cotton. 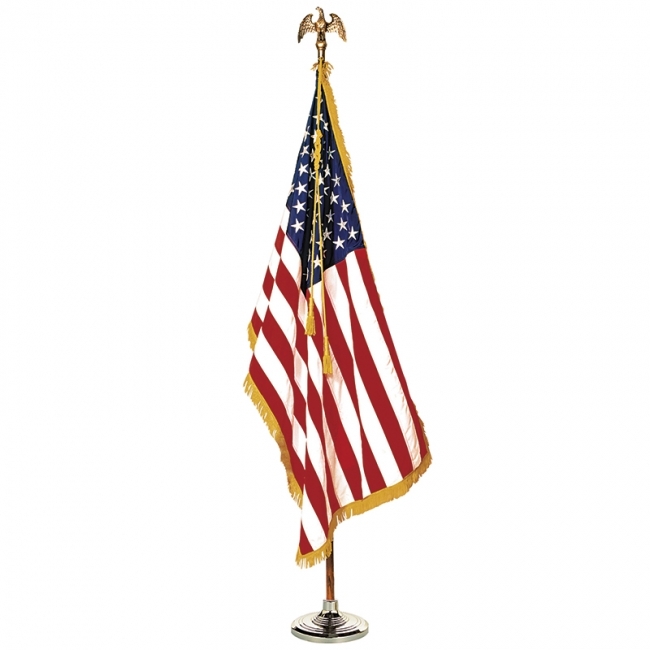 Engineered to be fade resistant in outdoor conditions, Verona Brand Flags wave proudly at parades and are most often used to mark our veterans' graves. Dyed in brilliant colors on silky rayon material. All hems are stitched and securely stapled to ebonized staffs with gilded spearheads. Great for a desk or the classroom. Anco-dyed in brilliant colors on silky rayon material; hem-stitched and securely stapled to ebonized staffs with gilded spearheads. Flag maesures 16x24". Staff measures 3/8 x 36"
Empire brand U.S. Flags are a quality line of indoor flags specially designed for use in classroom settings. Anco-dyed in brilliant colors on silky rayon material; hem-stitched and securely stapled to ebonized staffs with gilded spearheads. Flag Size: 24" x 36". 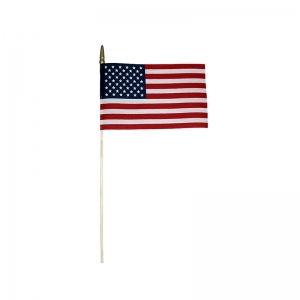 Staff Size: 7/16" x 48". 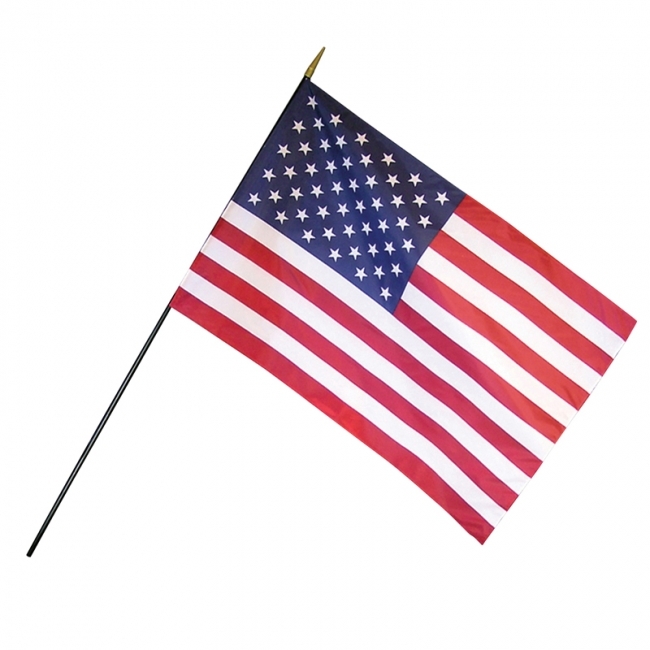 Our most popular and versatile outdoor flag, Durawavez flags offer the optimum combination of elegance and durability for every purpose. The 100% nylon material provides a rich, lustrous appearance. Durawavez flags have superb wearing strength due to the material's superior strength-to-weight ratio, and will fly in the slightest breeze. 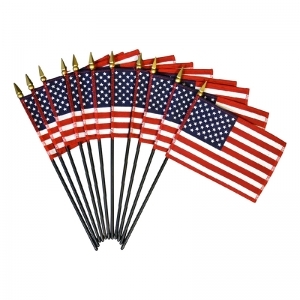 These flags have individually embroidered or sewn stars. Stripes are carefully and precisely sewn together with a special thread using a lock stitch for longevity. Durawavez flags are finished with strong, polyester canvas headings and spurred brass grommets. 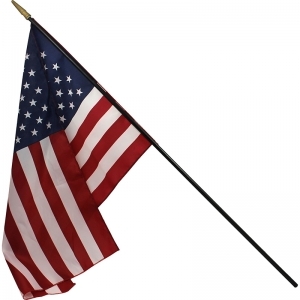 The result is a flag that will be flown with pride year after year.